For the area in Sonic Chronicles, see Metropolis (Sonic Chronicles). 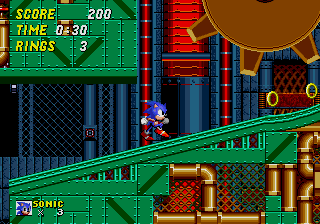 Metropolis Zone is the eighth zone in Sonic the Hedgehog 2. It is an extra-long level in which Dr. Robotnik resides. There are lots of machines, including the Pipe Teleporter and screw elevators, as well as pistons that vent steam from the sides. Dr. Robotnik protects himself against Sonic with spiraling eggs, each containing a fake Robotnik in the boss. Metropolis Zone has 3 acts, like all zones of Sonic 1 (save Final Zone). However, all the other zones in Sonic 2 have two or one. This is because Tom Payne (the artist in charge of this level) had also created Genocide City Zone, which was scrapped due to lack of time and that became the third act. Mad Gear Zone from Sonic the Hedgehog 4 Episode I seems to be based on Metropolis Zone, and even has all three badniks from Metropolis: Asteron, Slicer and Shellcracker. Also, the first part of the boss fight is the same as Metropolis Zone's boss. Unlike almost every other level in the 8/16 bit games, Metropolis Zone loops from top to bottom. There are several areas (most notably in acts 1 and 2) where you can fall seemingly forever and load up on speed and rings. Asteron - Starfish enemy, explodes when you go near it, launching 5 small spikes outwards. Slicer - Mantis enemy, throws two blades at Sonic. Shellcracker - Crab enemy, extends its giant claw towards Sonic. Referred to as "Shellcraker" in Sonic Jam. This page was last edited on 8 April 2018, at 07:53.